To try to help with an answer to Broadus, I spoke to David Wren yesterday & asked him the same question. I figured that since he had built many of these LS's with Jean in the 70's, he would have the answer. I have an OM-05, so I wondered the same thing. My inquiry was also about wood combos, hog vs. rw. He told me that especially with the twelve to the body, the sound would be much different. He went into aspects of the guitars that separate the similarity in sound (or differences?) & the same applied to the wood choice. He said it wasn't necessarily the wood,but how they were built. Based on what he told me, I switched to IS/HOG from RW. I sure everyone is familiar with Dave Wren, but for those who are not: He apprenticed with Jean for years starting in the 70's. He owns & operates Twelfth Fret in Toronto. Hope this helps. It did with me. Thanks, BluesMan. To follow up, is the difference of the FGIII and the OM one of volume (as in one is fuller than the other) or is it simply a distinction in sound? To clarify, I'm sure both are distinct in sound, but I'm wondering about fullness, especially if one were looking for an "all in one" guitar. Bill- as I found is usual with good luthiers is they almost speak another language @ times, as far as choice of words to explain just what you are asking. I don't remember the exact wording of his explanations, but I'll see if I can help. He made it sound pretty simple: each one would have it's own distinct sound, even with the same wood, based on how they are built. 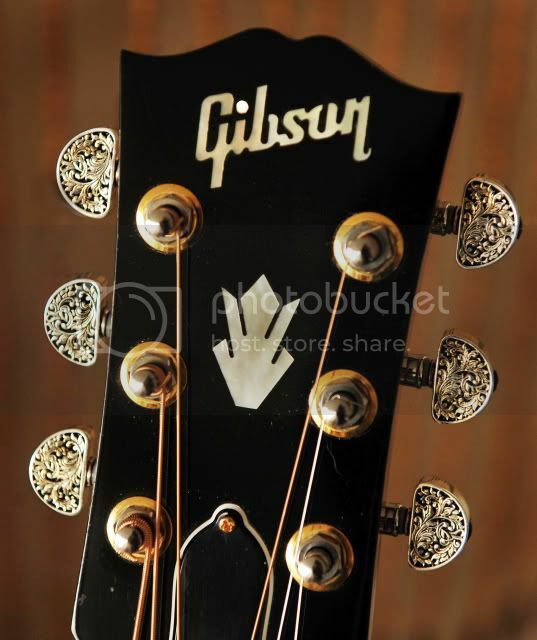 The OM is only slightly larger than the LS, but because of the neck joining @ the twelfth fret to the body, the bridge is moved down deeper into the lower bout. Long sentence ! He said that this would result on an increase in volume & also due to the body shape, it would have it's own distinctive sound. He mentioned the fact that Jean is using IS for the top, the result being unique tones generated by the IS. I read somewhere that with harder tops, such as IS (Euro spruce), a softer body wood has better results. That's probably why classical builders use cedar with a denser body wood, normally rosewood. My Epi AJ-500 came with nice open geared Grovers, which add a nice vintage touch. Personally, I'm thinking of swapping those out for the Pings. The price isn't bad either, around $75 or so. Bill- one thing I forgot to add. Dave said one of the most important thing when ordering a custom guitar is to walk in with no expectations of sound. He said it will give you a chance to really get a first impression of the instrument, with no preconceived thoughts in your head. This is encouraging. When hog was offered I switched from RW just because I wanted hog and I had a "feeling" about the IS with hog, that it would be something very unique. As others have said this may be the one I grow old with. It may be that my search for the git for me has just ended. I really hope so. Here's some Grovers on a 75 L-09 in the for sale forum. The best 12-fret Larrivee I have played (so far, heh) is the wonderful SD-50. Sitka over Mahogany and it had a unique and sweet sound, with a lot of growl in the bass as needed. As I have written earlier, my D-18GE is preferable to my ears. But for those who ordered IS/Mah, you'll likely be getting a very sweet guitar with a lot of range in the sound. It should be special. But for me I've been there and done that, having had 4 Larrivees with mahogany back/sides. I suppose Jim "could" change your order if you asked nicely (or called him on Sunday, assuming he's answering). With Euro spruce being popular in classical guitars and with rosewood being the preferred back and sides, I am salivating at the thought of this wood combination. However I am sure all hog will be very unique as well. If Jean didn't think it'd sound good, he wouldn't have offered it.. I know, just being silly I guess. I really want one of each!!!!! Well, we can only hope that we made the right choice and believe that Jean will do a fantastic job with his hogs! my laptop battery has 2% left..
... and rosewoods too. Amen. I am not liking all the discussions about how good Hog will be, as I have ordered RW. I have a Sapele OM, which dictated my decision. I think, as someone said previously, it is a case of wait and see what it sounds like, because we cannot really know withiut trying it. Wih regard to tuners, I understand that larrivee use Schallers in California, and Pings in Canada for the 03 series. The Schallers on my D-09 are way better than the pings, and can be bought from the Larrivee wearables site in chrome or gold. Rothesay Music do great buttons for them in various woods, pearl, ivoroid, tortoiseshell etc. Hand made, excelent quality. They fit pings also, but are not as tight fitting on them all (as with everything about pings, they just seem inconsistent). Rothesay are a member on here, but have not posted yet (they joined up a few weeks back). Tuners are the only thing I will upgrade on this guitar, if I even do that (and perhaps bridge pins, also from Rothesay). I would prefer it to stay as original as possible. No pickup, because I sold my recording equipmemt to pay the deposit!!! I just cannot wait until they are ready now. I have never had to wait for a guitar more than a few days before. What is the average monthly output of guitars from the Vancouver 03 level production site ? I'm beginning to get curious how much of a strain an order for 60+ guitars will place on their facility. I imagine they have a regular production schedule to fill orders from dealers around the world but I don't have a clue what their factory is capable of with regard to handling a special order such as this. Would you expect them to be completed in groups of 10 or 15 per month ? 20 - 25 ? It seems only logical to assume that we'll be receiving these over the course of several months once the first ones roll off the line, eh ? I'm sticking to the original Larrivee recipe. Rosewood... even though my OO-09 is also rosewood. I figure, there will always be used HOGS available. With my ears not hearing the nuances between a HOG and RW, I'm only curious but remain unmoved about HOGs. Besides, suppose I did order HOG, then I would always be wondering about RW. Just as there are rosewood fans, so there are HOG fans. I was a diehard rosewood type, but the more gits I play, the more I like mahogany. I played the SD-50 and SD-60 side by side a few months ago, and if there was any way that I could have done it, I'd have taken BOTH of those sweet babies home. I loooooooove those guitars. If I was going Italian, I'm honestly not sure which back I would have chosen...probably would have flipped a coin. So I just made the decision easy and went WHOLE HOG. BTW Ricky, what are you doing up so early/late at night? Does anyone actually have Schallers? Both the guitars I mentioned are above 03. Both have Pings, both are less than six months old. I got a set of Schallers from Larrivee. They look the same but are WAY better than the pings..
A bunch of great guitars I don't deserve and a gaggle of fly rods.... Aint life grand?